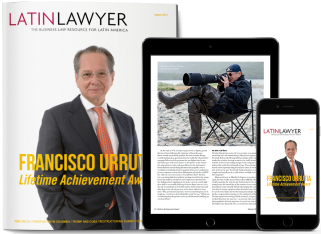 Speak to Latin America’s senior lawyers today and there is a strong sense that for many it was a fait accompli they would enter the legal profession. Coming of age at a time when professions were inherited from the generation before and rarely questioned, most willingly relented under pressure to take over the family firm or follow in a relative’s footsteps. In this sense, the career of Francisco Urrutia, winner of this year’s Lifetime Achievement Award, is truly exceptional. Even before embarking on a varied legal career that included spells working for the government, Colombia’s biggest companies and for one of the country’s leading firms, he had already achieved notable success as a professional photographer. Millennial lawyers in the process of crafting similarly colourful CVs are likely to find parallels in his story. Following Donald Trump’s victory in the US presidential election last year, lawyers around the world have scrambled to gauge the impact it will have on the legal frameworks underpinning trade and commerce around the world. We report from Latin Lawyer-GRR Live 2nd Annual Restructuring Summit on the effect the new president could have on NAFTA, and consider the effect of new regulations from the US on the operations of companies in Cuba. Also in this edition, we report from a roundtable of senior partners from Peru’s leading firms on the impact of high-profile corruption cases, technology and international firms on the legal market; we speak to the lawyers behind the acquisition of Colombian state-owned energy company Isagen by Canada’s Brookfield Asset Management; and we dip our toe into the debate surrounding proposed new rules governing data privacy in Chile.